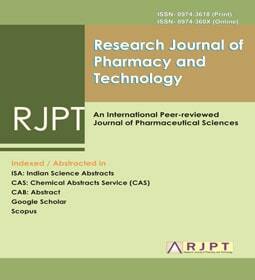 Research Journal of Pharmacy and Technology (RJPT) is an international, peer-reviewed, multidisciplinary journal, devoted to pharmaceutical sciences. The aim of RJPT is to increase the impact of pharmaceutical research both in academia and industry, with strong emphasis on quality and originality. RJPT publishes Original Research Articles, Short Communications, Review Articles in all areas of pharmaceutical sciences from the discovery of a drug up to clinical evaluation. Topics covered are: Pharmaceutics and Pharmacokinetics; Pharmaceutical chemistry including medicinal and analytical chemistry; Pharmacognosy including herbal products standardization and Phytochemistry; Pharmacology: Allied sciences including drug regulatory affairs, Pharmaceutical Marketing, Pharmaceutical Microbiology, Pharmaceutical biochemistry, Pharmaceutical Education and Hospital Pharmacy. . . . . Read more. Online since Sunday, Mar 31, 2019 Accessed 2445 times. Sangeeta Mohanty , Sthitapragnya Panda, Debashis Purohit, Sudam Chandra Si.